The real nature of war is revealed in the documentary series Vietnam Home Movies. By using actual footage filmed by soldiers who were there, the videos become highly personal. 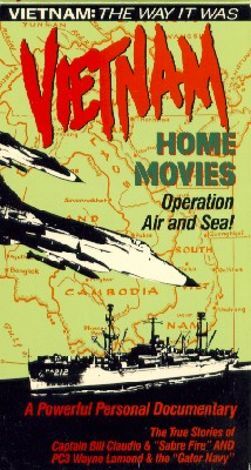 Vietnam Home Movies: Operation Air and Sea concentrates on the men who fought the less publicized battles. Captain Bill Claudio takes his 8 mm camera aboard the Sabre aircraft while PC3 Wayne Lamond journeys up the rivers of South Vietnam. On-the-spot narration completes this ultimate reality video.